I bet many of you have made banana muffins before. Show of (virtual) hands? 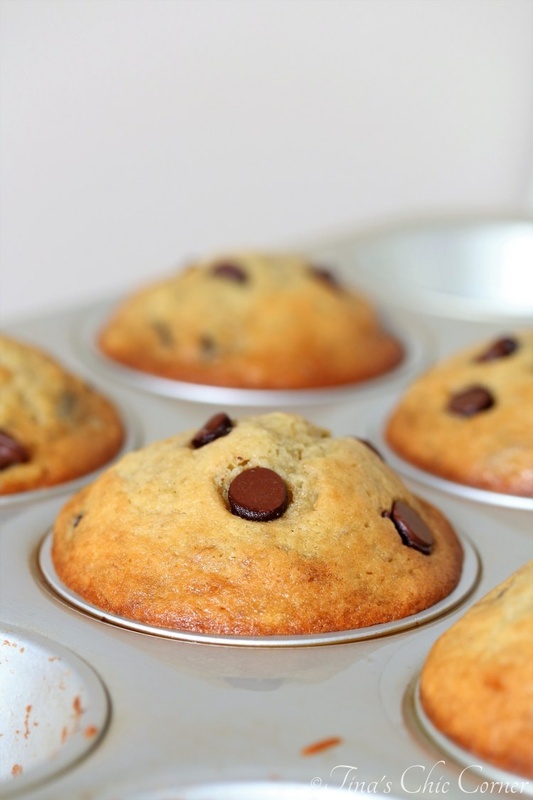 I know I sure have made my fair share of muffins, especially of the banana variety. A few years ago, I shared a banana muffin recipe where the muffins are loaded with pecans and a streusel topping. Then there’s the small batch of banana muffins which is awesome if you have one rogue ripe banana that’s one step from the garbage. 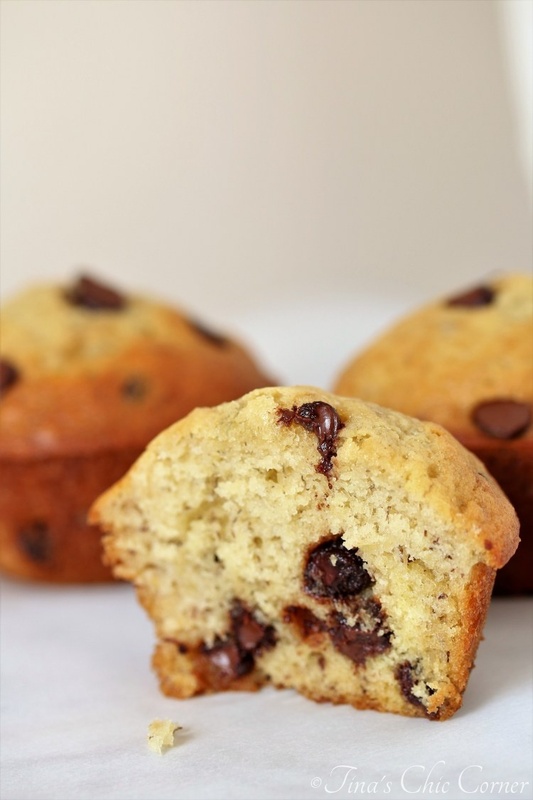 Let’s not forgot our chocolate lovers, because my double chocolate banana muffin recipe is pretty much the best thing going. I’ve shared a couple of other banana muffins that you can find in my recipe index, but those are my favorites. 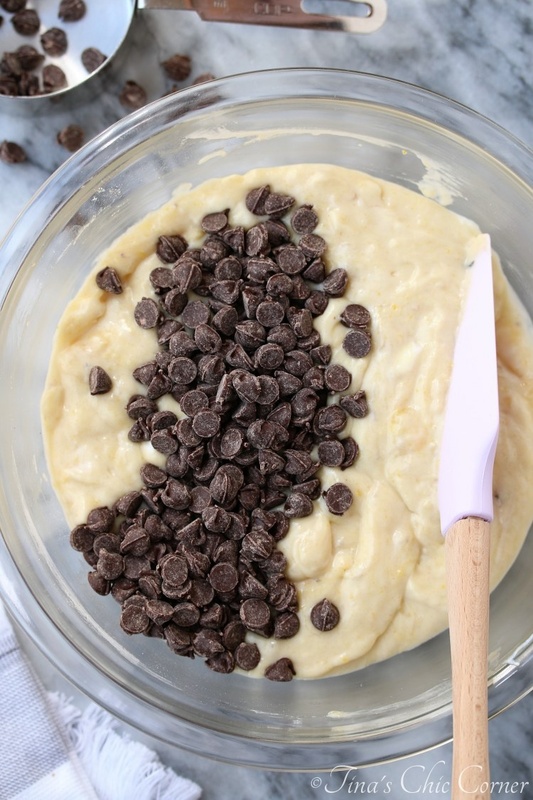 The second most popular recipe on my blog (of all time) is my chocolate chip banana bread. Many of my readers have turned the recipe into muffins, so I’m following their lead and doing the same. Holy cow, how have I not done this sooner?! 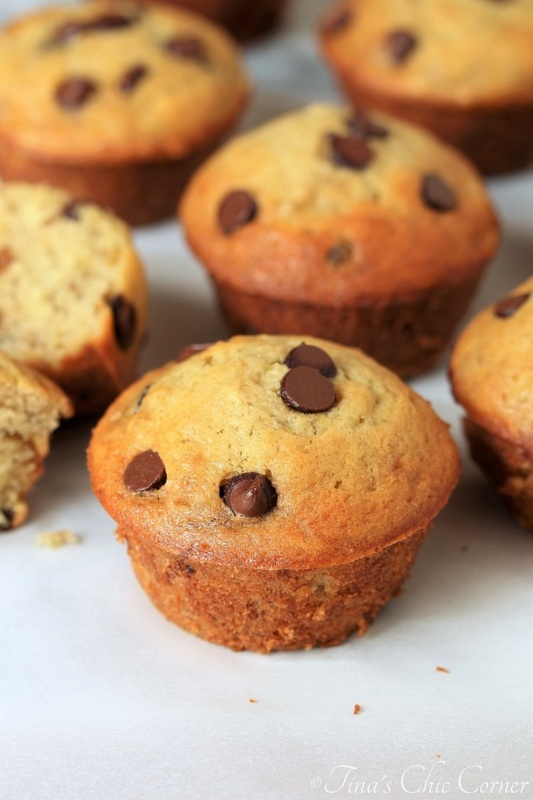 These muffins are seriously THE best banana muffins I’ve every made. Ever. I don’t know why I’m so surprised because the original loaf style recipe is uh-mazing so of course the muffin form is equally bangin’. I didn’t change a thing with the recipe and the only differences are the pan and the cooking time. Not all muffin pans are not created equally and I hate that. Don’t get me wrong, if you search for “normal size muffin pan” then they are all about the same size, but I’ve found that the shapes slightly vary. I filled the muffin cups almost all the way to the top. I baked them until they were golden brown on the top, which is slightly longer than other kinds of muffins. The bananas and sour cream make these muffins so moist, so they can take being baked a little longer in order to get what I call that “bakery color top.” Plus, I found that baking them a little longer means that they stay taller and don’t hunker down nearly as much once they’ve cooled. Don’t hesitate to freeze these bad boys. I freeze them as soon as they’ve cooled so they stay “just baked” fresh for whenever I want one. The microwave will do in a time crunch, but I just take it out of the freezer the morning that I want it. Freezing them is a great form of portion control and to make ahead of time for events. Mmm, that melty chocolate gets me every time. Do you see why I told you that you’d want to make these this weekend? In a large bowl, stir the melted butter and sugar together. Add the eggs and vanilla extract and mix well. Set the wet ingredients aside. Gradually mix the dry ingredients into the wet ingredients until just combined. Add in the yogurt or sour cream and the mashed bananas and mix until just combined. 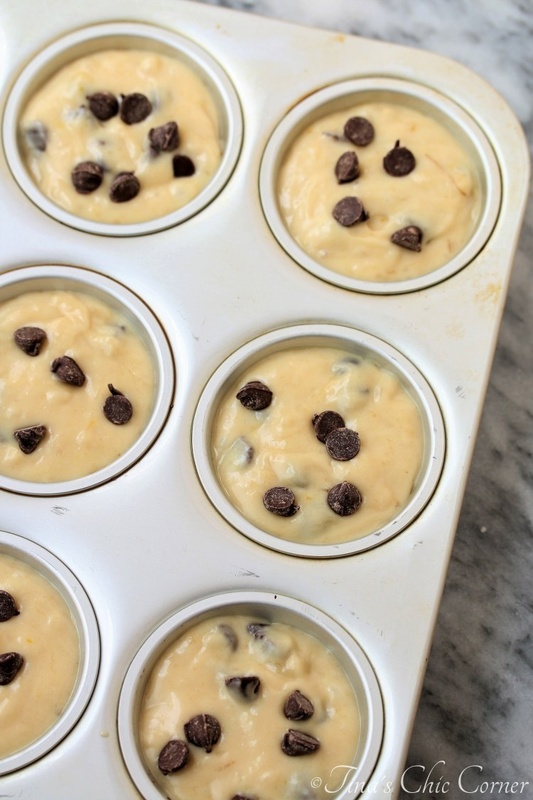 Pour the batter into the muffin cups, fill them almost all the way to the top. I got 10 muffins out of my muffin tin. Let the muffins cool in the pan before removing. Note: I mixed 3/4 cups of chocolate chips into the muffin batter and saved the remaining 1/4 cup for sprinkling on top of each muffin. 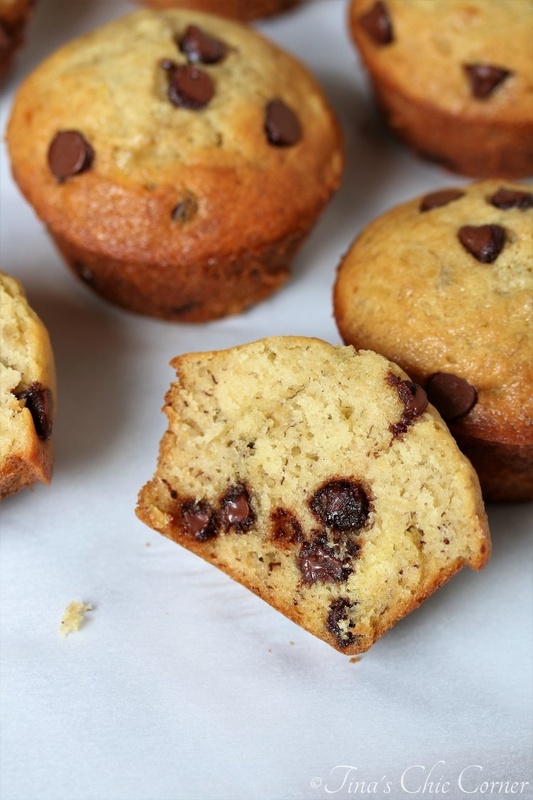 This is not required, of course, but that’s how I got chocolate chips to stay on top of each muffin.